This Bullet is a 1/10th scale stadium racing truck fitted with a powerful 4WD drivetrain and a super-powerful HPI Flux Brushless System featuring waterproof electronics and Li-Po cutoff, so it can power through all sorts of terrain and fly over any obstacles! Now fitted with a versatile and comfortable HPI 2.4GHz radio system, it’s easier than ever to control the speed of the Bullet! The Bullet ST Flux is just one member of a family of HPI vehicles which are based around a durable 4WD shaft drivetrain, 2 shocks per wheel and double-deck aluminum chassis. The Bullet off-road trucks feature either the silent Flux brushless system or Nitro Star 3.0 engine, and are available in different off-road truck varieties. In short, you can get the precise flavor of off-road performance you want with the HPI Bullet! The Bullet Flux trucks now feature a cool waterproof electronics compartment for the battery and receiver, a sealed waterproof switch, waterproof steering servo and finally a waterproof speedo that allows you to keep running your Bullet in extreme conditions that would kill almost just about any other vehicle! Want to tackle that muddy bug? How about that stream crossing? A bit of rain about to fall? It’s all good for the Bullet ST Flux! The HPI Flux system installed in the updated Bullet Flux kits features the same mind-bending brushless technology that makes the Savage XS, Savage Flux HP and Vorza Flux HP kits so absolutely insane – truly awesome power packed into a compact and tidy package! The incredible power from the Flux Shot motor gives the lightweight Bullet Flux trucks an immense power-to-weight ratio for ripping acceleration and blinding top speed! The Flux Shot motor features modern brushless inner workings wrapped with a cool black-anodized heatsink case, while the updated waterproof Flux Reload speed controller features bullet connectors for the motor, Dean’s plug battery connector and even a cooling fan right on top to keep things ice-cold! The power switch and setting button are both completely waterproof, and the electric connections are surrounded with a waterproof compound that lets you bomb through mud and puddles without a worry! The Bullet can handle up to 7 NiMH cells or 3S LiPo batteries to give the truck insane top speeds and amazing acceleration! Do you want on-demand wheelies? Go on, give it a try – you know you want to! Finally, the Flux Reload V2 speedo can be fully customized with the amazing #101280 2 in 1 Professional Program Card! Turn your forward/brake/reverse speed controller into a forward/brake only controller for racing, or a forward/reverse controller for rock crawling! Fine tune things like initial punch, braking power, drag brake and more, with just the push of a button! Formed from 6061 aluminum for a combination of strength and light weight, the Bullet Flux chassis is durable, looks great and forms the ideal backbone for all the various components that make the Bullet trucks so tough! Braking power is provided by the HPI Flux brushless motor, giving just as much stopping strength as the steel disc brake supplied on nitro versions of the Bullet! Just push the controller trigger forward for immense brakes and the ability to stop whenever you want! The shock absorbers are factory-fitted just like everything else on the Bullet ST Flux, and are precisely filled with oil for exceptional handling in turns and cushioning when landing big jumps. With big coil-over springs they are the perfect match to the long suspension arms! Optional mounting points are provided on the suspension arms for lowering the stance of the truck slightly (great for running on-road) and stiffening up the suspension at the same time, without using option parts. • Waterproof HPI Flux Reload v2 speedo with fan and 3S LiPo capability! • Painted and detailed bodyshell ready to strut its stuff! • Additional track-tuning options included in the kit! I’ve checked the bullet FLux ST and the Bullet flux MT for a long time. They were only available in Europe. Does that means that they will be released in America as well? If so, great news! 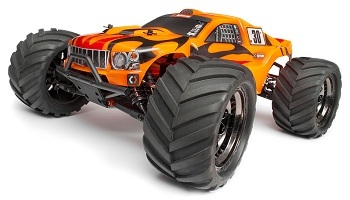 I was looking for a monster truck that could use only one battery…glad I waited!